I still feel like I just returned from California (I know, I know, it's time to let go), so I decided to invent a new flatbread. 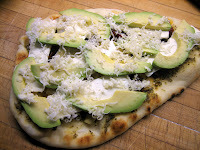 In the tradition of calling anything with avocado the "California" version of that thing (California pizza, California burger, California chicken sandwich, etc....) this shall be dubbed the California Flatbread. It is quite a lot different from my standard "roast/preserved Italian veggies, goat cheese and pesto" flat bread and my "mango brie" flatbread, but clearly had a cuter name, and is a good addition to my usual lunchtime repetior. As with all flatbreads, this one is just a fun group of toppings piled on a pita, or in this case some leftover naan bread, and then warmed up so that I feel like I am getting a hot lunch. The base is just pesto (look at how much pesto restraint I exercised! ), sundried tomatoes and artichokes (other ingredients that help support the random "California" label). On top, I layer thin slices of feta cheese, avocado slices (the more the better), and a tiny bit of grated mozzarella cheese so that there is something to melt. Five minutes in a 350F oven, and voila! Lunch! I'll take a slice please. It looks fantastic. oh yum! all my favorite ingredients!! That's my kind of lunch! 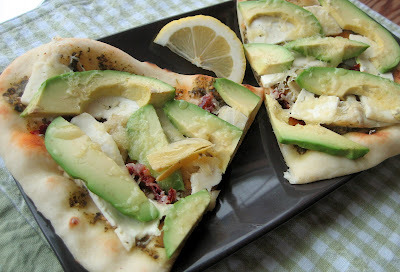 I like the sound of using avocado on a flatbread/pizza! Liberté Méditerranée Yogurt - Best Ever!